Good composition is another piece of the puzzle in creating stronger, more pleasing images. Most photos are composed of multiple elements and sub-elements that are framed together. How we choose to include and visually position these elements will contribute to the success or failure of the final image. This presentation will provide guidelines to improve your compositions. Aspects of photography can be comparable to other art forms. For example, music can have a distinct melody, harmony, background singers, etc. All these individual parts work together to produce a song that is greater than the sum of its parts. Such is true with photographs. We typically have a main subject or focal point, foreground, background, supporting elements. A good photographer will include the pieces that work together to enhance the subject and eliminate the distracting or conflicting elements, and so on. Sometimes we just get lucky, but generally, a good image needs to be thoughtfully “composed” right before we release the shutter. As a teen, Mike learned a few photo basics from his father, a photographer and artist. He dabbled with film cameras in the 80’s and 90’s, and after that with a few digital point-and-shoots. However, it wasn’t until 2006, when he purchased a basic DSLR, that he began to see the potential of this “new” digital technology. After a chance meeting with member, Willa Friedman, in 2008, where he learned about NVPS, he joined in 2009. He has served on the board from 2010 to the present and served as president in 2013. In 2018 he was awarded the distinguished service award. 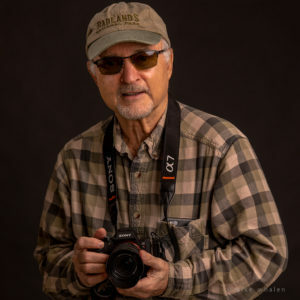 From participating in many NVPS competitions, he received numerous annual awards including, “Photographer-of-the-Year”, “Color-Print-of-the-Year” and “Image-of-the-Year” at various times. In recent years, he also scored three cover shots on the Spring editions of Washington Gardener Magazine and in 2016, he won Nature Visions “People’s Choice” award. Mike also donates his time regularly, as a pet photographer for the Fairfax County Animal Shelter and, volunteers as a photographer for charitable organization’s annual DC events such as: The National Ovarian Cancer Coalition and The Epilepsy Foundation of America.